In the past few months, it’s sometimes seemed that blogging is pointless. Who even reads what I write? The thing is, selfish as it may seem, I’ve always blogged for me. Because I absolutely love writing. Sharing what I love and believe, however satisfying, often seems lost in a virtual sea of the online space. In the past some of my favourite online-rs like Sneh from Cook Republic and Jaclyn from Blog Society have shared similar musings – that this blog-thing and all that comes with it, is tough. Putting yourself out there, (and sometimes hearing crickets), obsessing about the perfect lighting and shot to complement your story, in my case testing and re-testing recipes that may never be tried. I’ve read about “lucky breaks” and blogs who sky-rocketed in popularity thanks to social media platforms. Heard people remark that they’re starting a blog, as if its nothing. For me, and yes I’m just one person, balancing uni, growing a new business, blogging and being a human has always been a choice. But not one without its costs. And that’s often what people fail to mention about this world. The professional design of the site, the management of that site, the running costs, the mailing list services, the tech features, the food (so much food!) and of course the time. Thinking, researching, writing, creating, testing, shooting, editing, talking, evolving, marketing. To have a successful blog, a highly subjective term of course, is a whole lot about marketing. Often about who you know as opposed to what you know. About how much virtual real estate you can sell. How many sponsorship deals you can strike. The numerical value that you offer to companies and products. Right from the beginning in early 2013, I knew I wanted no part in that game. It was an informed decision and I knew the cost I would pay. Regardless and perhaps sometimes in spite of all that, I love this blog. I’m proud of every word, thought, recipe and photo that you see on here. Reading one comment and receiving even just one email makes my day because you’re a human being and you connected with me. Maybe you’ve tried a recipe and experienced success that you want to share, or something I’ve shared made you feel understood and supported. This was always my goal. To bring what I know and love to you; to people who care about the same kind of things. People who are perhaps looking for inspiration, information or practical guidance. I still struggle sometimes to find the line between being myself, offering something of value and not sharing too much – both for my sake and yours. I’ll review a blog post, for instance this one, and reflect that missing is the current intensity and stress that I’m experiencing. That my brand new Healthy Baking Mixes sold out in a week, and as well as online are now stocked in 5 stores. One week! That I received a distinction in Nutritional Biochemistry this morning. Or that hubby and I are off to the jungles of Bali next week for 11 days of unplugged, offline bliss. But then I once again remind myself that I am this work and just like it, I’m a work in progress. So to continue being proud, and in the spirit of evolving, here’s my final recipe of the year complete with pretty pictures and a video! Happy Holidays to you and your loved ones. Thank you for your support and see you (after a little island break that I’m taking from next week) in 2017! Chocolate it seems, is always a winner. 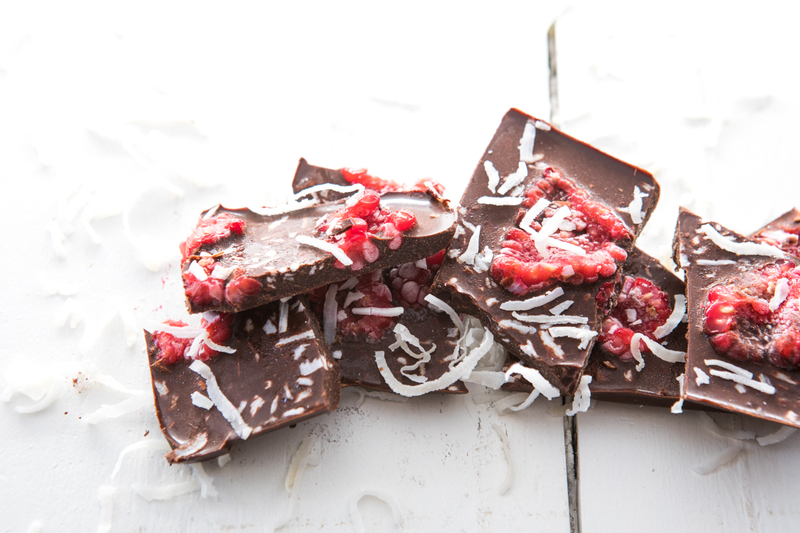 This recipe is for raw chocolate however don’t let that fool you. I’d encourage you to try it, because most people can’t tell the difference between this and dark chocolate. It’s still sweet and it’s still delicious! What I particularly love about this chocolate is that a little is enough (for most!). And that’s due to its quality and satisfying fat content that helps balance the natural sugars. Aside from containing no fillers, additives and preservatives as absolutely all commercial chocolate does, this chocolate is super simple and requires no skill. Once mastered, use the recipe as a base for your own chocolate making. As this is raw chocolate, it needs to be stored in the fridge or freezer. 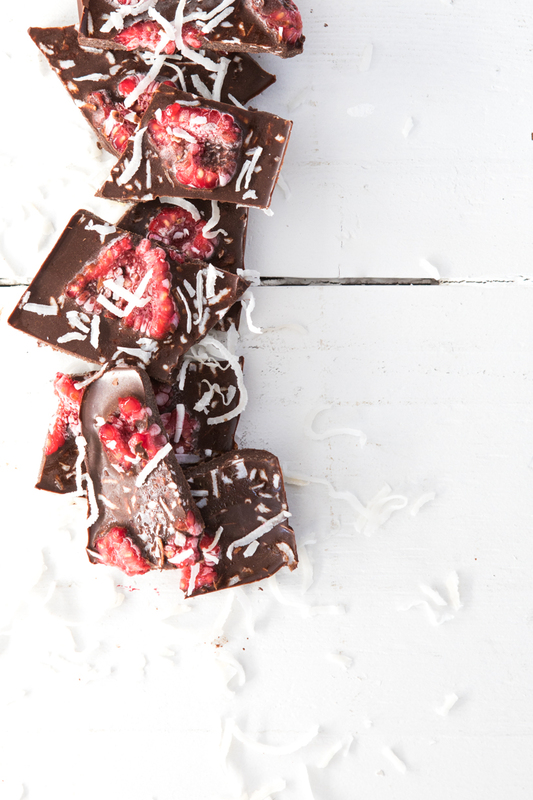 Have it on hand for those moments when only chocolate will do or serve to guests and impress! Substitute maple syrup for honey to make the recipe vegan. 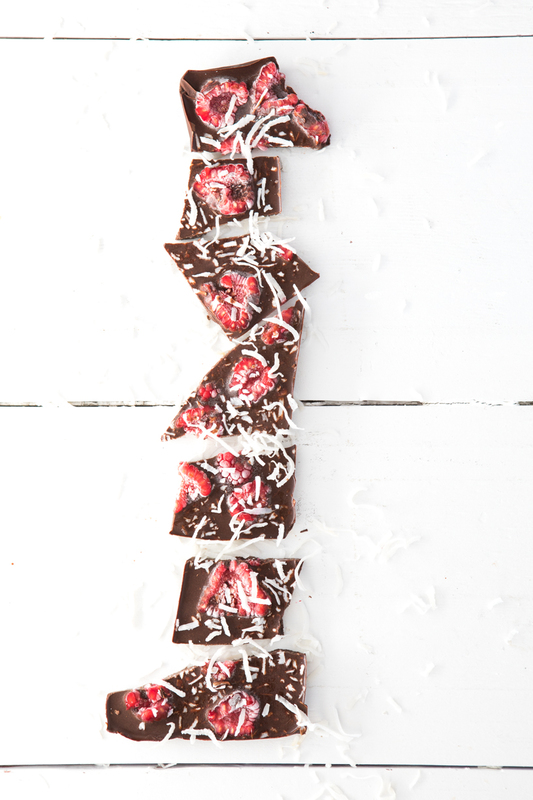 Add in whatever fruit or toppings you prefer to make this chocolate your own! I love making this simple recipe and having it in the freezer to enjoy on demand. A good one for your Christmas (or anytime!) table. Make it! Enjoy it! Share it! And if you love the look of this recipe, join my tribe for free below and have tastiness like this delivered straight to your inbox. You’ll find more chocolate recipes here.